Dmitri Ivanovich Mendeleyev (also commonly spelled "Mendeleev") is a famous Russian Chemist who contributed to world progress by categorizing the basic building blocks of gas, liquids, and solids (both natural and man-made), and formulated the famous "Periodic Table of the Elements" which revolutionized chemistry throughout the world. 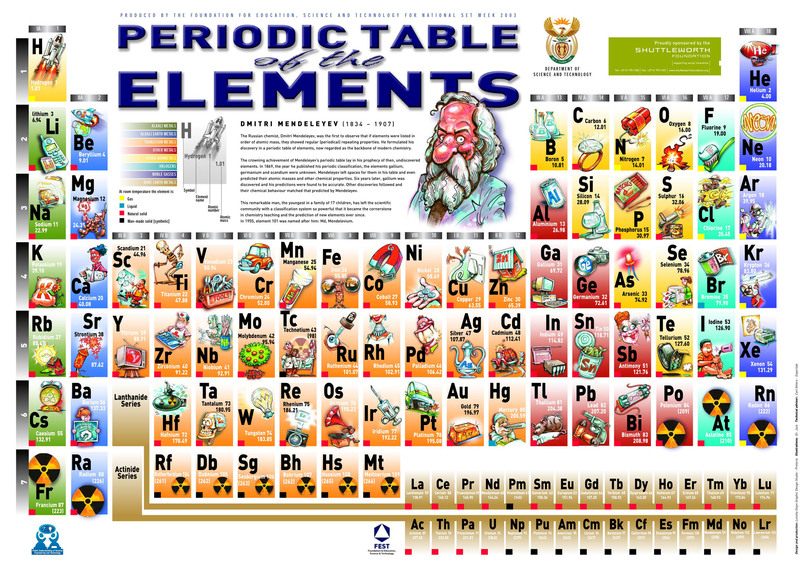 Dmitri's contributions are among the most important to scientific education and the Periodic Table of the Elements continues to be one of the most prominent research tools used in modern scientific advancement. The discovery of critical constants (such as critical temperatures), the systemization of ideas which lead to the formulation of "periodic law" (that put a notable emphasis on atomic weights) and the periodic table of the elements were required for a new textbook he wrote, entitled "Principles of Chemistry," which was initially published in more than a dozen editions in the Russian, English, French, and German languages. His works were strongly influenced by many great scientists including, particularly, Robert Bunsen and Stanislao Cannizzaro. Although Mendeleyev also predicted the existence of more elements, he was met with much skepticism as he refined his laws, until eventually some of the missing elements, Gallium, Scandium, and Germanium were discovered, which fulfilled his predictions and lead to the universal acceptance of the "periodic law" he had been working on so diligently. 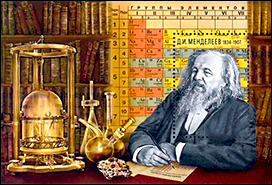 The 101st element, "Md" (Mendelevium), was named after Mendeleyev to honour his tremendous contributions to chemistry. Other signficant contributions include the work he did in 1893 CE in his appointed role as the Director of the Bureau of Weights and Measures, which standardized the world on the metric measurement system (the Bureau has been largely successful as only a small number of nations continue in the 21st Century CE to use non-standard, antiquated, and often confusing systems of measurement).